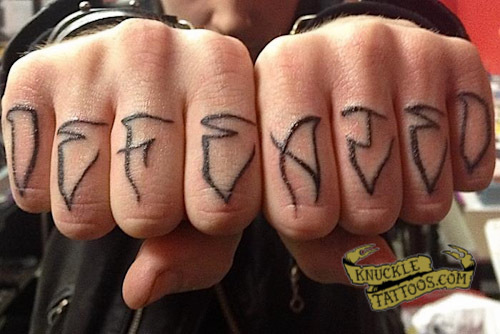 I had wanted “defeated” across my knuckles for quite a few years now and just recently decided to man up and do it. I was really tired of seeing overwhelmingly positive messages on knuckles and getting to know the people with them and realizing they were everything but. If anything I’m a realist, life doesn’t always go exactly the way you want it to. My tattoo says that – very clearly. is there a name for that kind of font? I’ve been writing ‘defeat-ed’ as my graf name for almost 20 years now… never seen anyone else with it… keep it defeated.